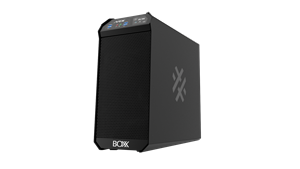 AUSTIN, TEXAS and SAN JOSE, CA, March 20, 2019 (GLOBE NEWSWIRE) -- BOXX Technologies, the leading innovator of high-performance computer workstations, rendering systems, and servers, today announced that the APEXX W3 data science workstation will demonstrate Datalogue’s proprietary software designed to reconcile disparate data sets at BOXX booth #520 at NVIDIA’s GPU Technology Conference (GTC). Held through March 21 in San Jose, GTC is the premier AI and deep learning event, providing attendees with training, insights, and direct access to experts from NVIDIA and other leading organizations. For further information and pricing on the APEXX W3, contact a BOXX sales consultant in the US at 1-877-877-2699. Learn more about BOXX systems, finance options, and how to contact worldwide resellers, by visiting www.boxx.com. For dedicated, multi-GPU, cloud-based deep learning solutions, contact the BOXX-owned Cirrascale Cloud Services at (888) 942-3800 or visit http://www.cirrascale.cloud .